Tolland, CT – Mastercam X7 Lathe delivers a suite of new features aimed at increasing your productivity. From the new Dynamic Rough toolpath and Rough Zigzag motion, to Face Grooving and more, Mastercam X7 Lathe ensures that you’re ready for any job in the shop. The Lathe Dynamic Rough toolpath is designed for hard materials cut with button inserts (i.e., radius or ball). The dynamic motion allows the toolpath to cut gradually, remain engaged in the material more effectively, and use more of the surface of your insert, extending the tool life and increasing the cutting speed. The new options for Lathe Rough toolpaths provide you with more control of your zigzag tool motion. You can choose to move back and forth, straight across, or ramp downward with each tool pass. 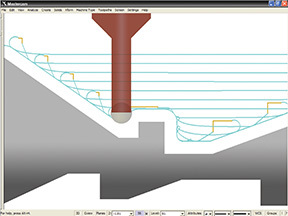 The new grooving parameters allow you to position your tool accurately for face grooving. Enter a maximum and minimum start diameter for positioning the first groove cut. In previous versions of Mastercam, the Plunge Turn toolpath only supported flat bottomed tools. In Mastercam X7 Lathe, full radius tool support is available. For more information on Mastercam X7 Lathe, please visit www.mastercamlathe.com. To see a video about the new enhancements in Lathe, please visit http://whatsnew.mastercam.com/lathe_overview.html.